If you follow Entourage star Adrian Grenier on Instagram, you probably already know what this image is about. But for those who aren't in his 114,000-plus following, the above is Grenier's response to rumors that his own greediness and greediness of his co-stars is causing the series' spin-off movie to stall. 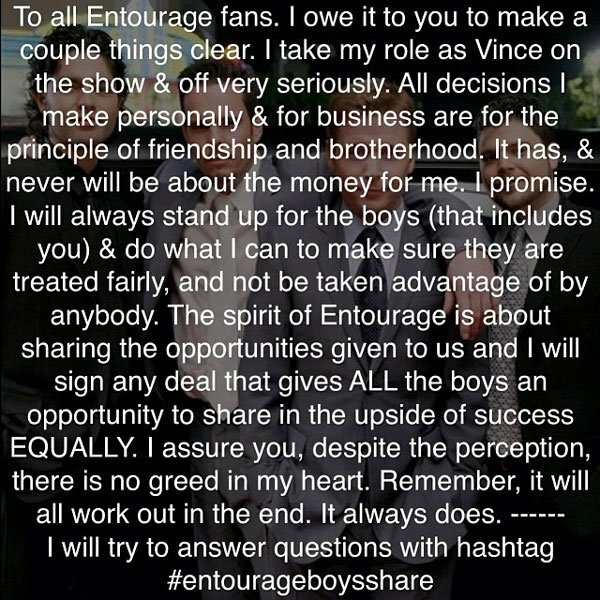 "To all Entourage fans. I owe it to you to make a couple things clear. I take my role as Vince on the show & off very seriously. All decisions I make personally & for business are for the principle of friendship and brotherhood. It has, & never will be about the money for me. I promise. I will always stand up for the boys (that includes you) & do what I can to make sure they are treated fairly, and not be taken advantage of by anybody. The spirit of Entourage is about sharing the opportunities given to us and I will sign any deal that gives ALL the boys an opportunity to share in the upside of success EQUALLY. I assure you, despite the perception, there is no greed in my heart. Remember, it will all work out in the end. It always does. ------ I will try to answer questions with hashtag #entourageboysshare"
This statement suggests that Grenier is holding out on signing on to the Entourage movie in a bid to get equal (though presumably still high) paydays for himself and his co-stars. This kind of negotiating tactic, where the biggest asset to the project stands firm until his demands are met, has been used before to great success. Recently Robert Downey Jr. reportedly used his renegotiation deal to get raises for his Avengers co-stars, and The Hangovers' Ed Helms, Bradley Cooper, and Zach Galfianakis teamed-up in their contract talks with Legendary Pictures to get a whopping $15 million each to make The Hangover Part III. But Instagram promises are worth about as much as off-the-cuff remarks made while trying to catch a flight. Which is to say none of this suggests an Entourage movie is any closer to being made, despite getting the green light from Warner Bros. last January. For now, fans will just have to wait until deals are made or Vincent Chase and his posse takes to social media or TMZ.